44 cm tall (17 inches). Length 26 cm. Depth 26 cm. 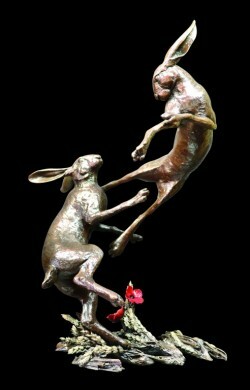 Dramatic and very impressive bronze figurine showing two hare boxing Michael Simpson. Limited edition of just 50! All bronzes are produced using the lost wax method. Each bronze is decorated and finished using the traditional method of patination and comes beautifully boxed with a certificate of authenticity. The certificate also includes info about the artist and the edition number eg 7/50. Robust and heavyweight ornament made from solid foundry bronze (not hollow). Hand finished patina. Each figurine has a unique finish. Each figurine is supplied in an attractive gift box and has the limited edition number engraved onto it.